Certified Online - In-Service Training "Your Leading Source for Training"
Welcome to MPI'S E-Learning training. Stay on top of your game with state of the art Law Enforcement training and education. MPI presents certified In-Service Training, above and beyond that which is required for police officers - Our online training allows you the convenience to access and complete the training at your own pace. Want to keep ahead of others striving for promotion - Come to the source for Training! Don't have a subscription and want to find out more? Click Here or the button to the right. 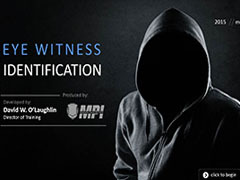 Eyewitness Identification refers to the aspect of a criminal investigation where a witness who observed the offender attempts to identify him. Part of this training, you will receive actual accounts of eyewitness identifications that resulted in the incarcerations of innocent persons and the unintended consequences that occur. We will take a close look at the "Eyewitness Identification Process" in its entirety. This training will focus on understanding and implementing fair and impartial police procedures. Police legitimacy means that people have the utmost trust and confidence in the police, accept police authority and believe that police officers are fair and just. We will present some “best practices” for attaining procedural justice as well as offering suggested recommendations for your respective agency policies and procedures. The MPI First Responder training will look at workplace safety, employee wellness, managing stress and the risk of infection. This training will address a multitude of emergency care issues as well as a new approach to drug overdose calls and how we can administer the fast acting antidote to heroin, “Naloxone or Narcan.” In addition, we’ll talk about the Good Samaritan Law and the “Duty to Act.” We’ll examine medical, legal and ethical issues. This training program will provide the responding officer with the initial protocols for responding to a reported suicide or sudden death. It is a guide to suicide investigation, incident scene analysis, evidence collection and report writing. “Suicide or Homicide”, you can’t afford to be wrong. When responding to a call of suicide or sudden death, let this MPI basic suicide investigation training program be your guide for coming to the right conclusion. This program we will address contemporary issues around force application, officer survival tactics and the risks of complacency in an aggressive society. We take a close look at the Police Use of Force in Society, when and why we use it, and to what degree it may be necessary. We’ll review the totality triangle, threat perception, de-escalation and some proven methods in conflict resolution. This year we will examine new case law and legislation recently issued. We will look at new case law examples and the factors considered by the courts in such topics as Search and Seizure, Threshold Inquiry, Stop and Frisk, Firearms, Field Encounters and Reasonable Suspicion. We will revisit cell phones and their protected data as well as search warrants, exigency and exceptions to the hearsay rule.